I was at a USV event last week in SF and I bumped into Sung Hu Kim, a product manager at Twitter who handles mobile stuff. We got to talking about things I'd love the Twitter Android product to do. I mentioned that my daugther tweets a fair bit but I often miss them because I follow 735 people, many of them prolific tweeters. I do have a family list but I only get around to checking it every few days and I often miss opportunities to @reply to Emily. Sung pointed me to the mobile notifications settings and we turned on notifications for Emily on my Android. Game changer! Now I get a notification every time she tweets and I can immediately favorite it, retweet it, or reply to it. I turned on notifications for about ten others including of course my wife. Here's how to you do it (I assume this works on Twitter for iPhone too but I don't know for sure). 1) Navigate to someone's profile. You can do that by clicking on their avatar in a tweet. Here is my friend Bijan's profile on my phone. 2) Do you see that little image of a head under the block that says "tweets" on the middle left? You click that. And you get this dialog box. Click on "turn on notifications". That's all you have to do. 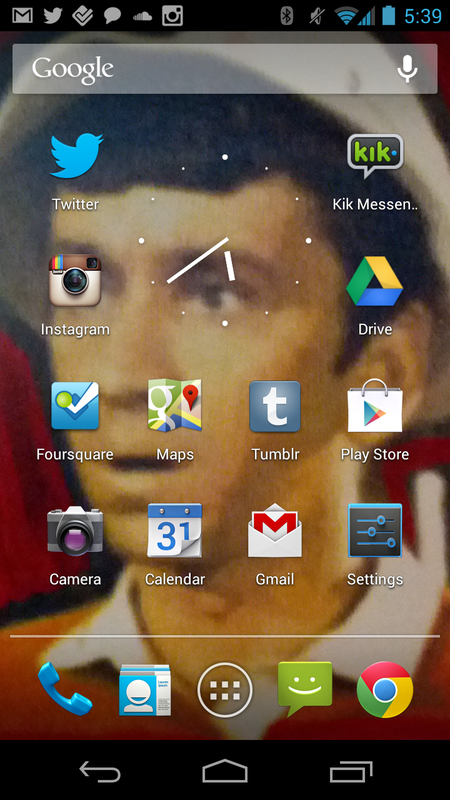 For those that are curious, that is Gilligan on my home screen. My friend Josh Harris painted that Gilligan and the original hangs in my office at USV. The Gotham Gal also has a Gilligan in her office. For those that know Josh and his obsessions, it has great meaning. It represents the crazy web 1.0 era in NYC in my mind. It is one of my favorite art pieces we own. 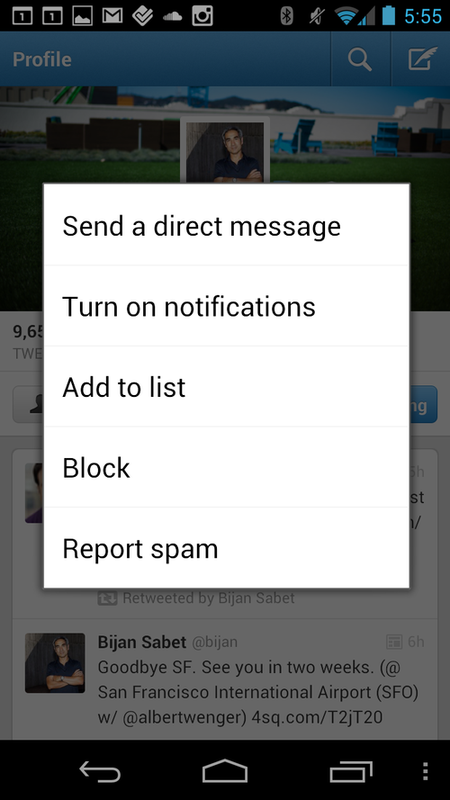 4) When you pull down the notifications tray on Android, you actually can see part of the tweet. And you can click on it to go to the tweet. 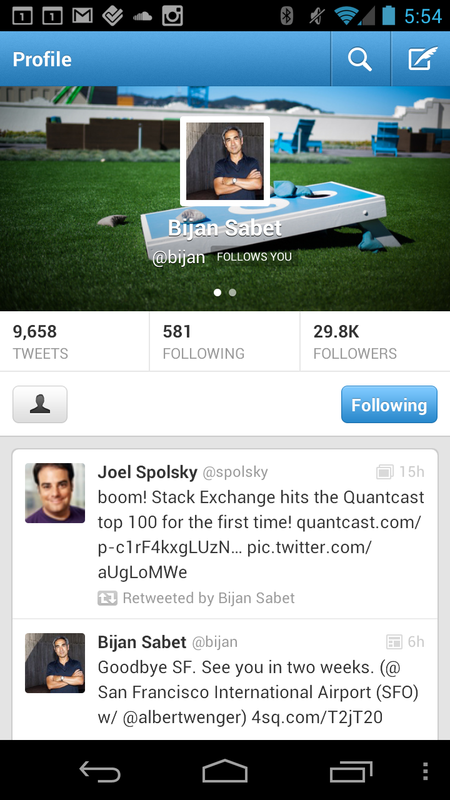 Here's a notification of a tweet from Bijan (who I've added to my mobile notifications as well). I have had this feature active on my phone for the past week and it has significantly increased my usage of twitter as I am now seeing in real time the tweets from the folks I care most about. I love it.